Molding Quality: 9 - Thunderbird 1's nose cone comes to a sharp enough point to poke a hole in the plastic bag it came in. Accuracy: 10 - the TB-1 models built for the show never matched each other, and this model has features representative of all of them. Overall Rating: 9.75 - this is the best injection kit made of TB-1, would have been a 10 if the kit included a stand, and the internal kit bracing was a bit more robust. Thunderbird 1 is the hypersonic first response aero-space craft of International Rescue, piloted by Scott Tracy and my favorite of the five Thunderbird craft. TB-1 blends the look of the X-15 with the variable sweep wing of the F-14 and the needle-like versions of today's hypersonic designs with a healthy dose of retro 60's JLC (just looks cool)! The Thunderbirds craft have been rendered in model form for years, and usually originate from Japan and England. 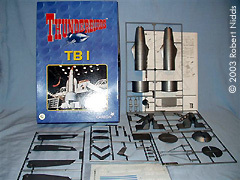 Most people remember the iconic green cargo transporter Thunderbird 2, and as a result TB-2 is well represented in styrene model form by the Japanese companies Bandai and Imai, and in most cases reproduced with reasonable accuracy, usually with the cargo of submarine Thunderbird 4, and in various scales. Thunderbird 1 and 3 haven't fared as well. 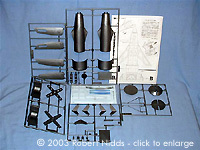 The models available of these craft fall into two opposite ends of the spectrum - the Japanese styrene versions are designed to be more toys than scale models, and while reasonably priced, aren't very accurate. 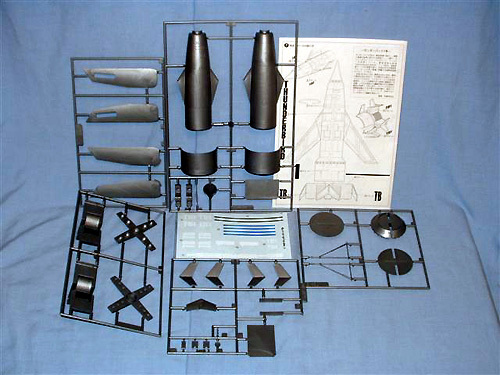 Thunderbird 1 usually needs a total reconstruction to accurize it, and the proportions of the Thunderbird 3 models is off by so much that a scratchbuild is easier than buying the kit. 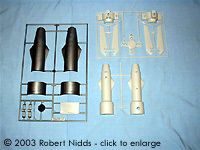 The kits available from England are larger, and much more accurate, but are usually resin cast or vacuum-formed, and as a result much more expensive, and while not necessarily more difficult to build, do require more advanced modeling skills and are not as forgiving of mistakes in construction and painting preparation. So I was delighted when I saw that Aoshima was going to produce an injection molded model of Thunderbird 1, in 1/144th scale, using all new tooling, and I haven't been disappointed. , but they show 2 different SFX models from the show, and aren't very sharp, so best view the show (now being offered in the USA by the great folks at cable channel Tech TV, or on DVD) or consult printed reference materials for detailing. The parts are molded with no flash at all, and panel lines are recessed and crisp. As far as detailing and accuracy goes, the best that I can determine (with the reference materials I've obtained through the years) is that Aoshima took what they considered the best features from each of the several SFX models used in the production of the show, and incorporated them into the model. TB-1's conjectural length is 115 feet, and the model does measure out to be about 10 inches long. As the text commentary that Tech TV provides as the show airs gently (and quite humorously) points out, the SFX models made of TB-1 never match each other. Markings on them shifted positions and fonts and were included on some models and not others, the distinctive v-shaped stabilizing fins shift position fore or aft and a blue stripe appears and disappears on the rear power unit depending on the model. Panel lines on the originals were drawn on using a black ball point pen and are difficult enough to see even on DVD, unless a particular part of the craft was shown in close-up, and the close-up model usually didn't match the model shown in the long shot - which is part of the charm of the series. So the panel lines on the model are positioned subjectively, but capture the “look” of an advanced aero-spacecraft well. 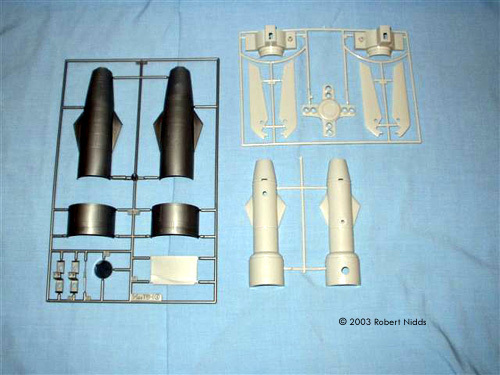 You can build TB-1 with landing gear down or up, and Aoshima thoughtfully provides you with a fifth fin assembly that contains the rear skid, rather than having you drill the hole for the strut yourself, and the latest pressings of the model give you the option of using wheels (shown once in the premiere episode “Trapped in the Sky”) or the more frequently shown skids. There are just a few changes you may want to consider as you build the model to increase its strength and durability. The forward plate of the rear power unit requires that it be reinforced with 4 rectangular styrene rods, and the kit provides 6 just in case. I am going to build a more durable structure from sheet styrene, and drill a hole through the forward plate for a supporting rod to connect the lower fuselage to the aft power unit. The pivots for the wings (that swing fore and aft) are fine for a model that will have the wings gently positioned, but my nephews will no doubt want to re-enact the adventures of International Rescue, and the pins of the interlocking gears may not withstand a more enthusiastic wing deployment, so this area will require a rebuild as well. I'm leaving the gun positioned under the forward fuselage just behind the nose off for this reason as well - it's not deployed when the craft is in normal flight, and will snap off easily if the model is handled. If you build TB-1 with the landing gear down, bear in mind that the struts as provided with the kit are thin, so you may want to replace them with stronger metal versions. The decals are well done, but don't feature the thin lettering style of the markings on the model shown in the opening credits - my personal favorite version of TB-1. So this may be replaced by custom made dry-transfers, or hopefully some custom decal provider will offer more correct markings (please?!). Simple enough for a beginning modeler, and detailed enough for an experienced one, this is the best injection molded model of TB-1, without a doubt, and at a very reasonable price. Other than the changes in construction (which are my personal preference only, the kit is structurally sound as is), I can't find much to fault with the kit. Why a stand was not included is puzzling - if you don't build the model with the gear down, you have to display it upright on its tail, obscuring the great detail of TB-1's engines. The 1/144th scale means that TB-1 can come to the aid of most aircraft and spacecraft modeled today if dioramas are your forte. I'm hoping that Thunderbird 3 will be next in this series. And just think, there are all new versions of the Thunderbirds in the upcoming movie… I was able to get a copy of the licensing brochure for the Thunderbirds movie, and it has a scale comparison drawing showing the new designs - Thunderbird 3 has fins on the 3 engine units, and what looks like a secondary craft built in. Thunderbird 2 has its fins moved rearward and the large red engine "cans" left off, and Thunderbird 1 looks even more like an F-14 on steroids. Many thanks to Robert's wallet for providing the review sample. Manufacturers and retailers, interested in getting your wares reviewed and publicized on a site averaging 3500+ readers a day? Contact us! This page copyright © 2003 Starship Modeler. Last updated on 16 July 2003.